When process sample pressure is too high, or the application calls for a fixed amount of sample, Texas Sampling's fixed volume sampler is a perfect selection. 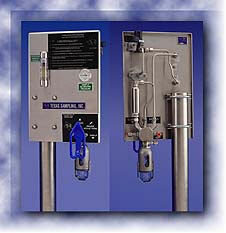 By turning one valve, you can isolate sample pressure, purge sample bottle before dispensing, and verify purge flow. Internally, our valve combines four different functions. A specific amount of sample is captured in a fixed volume chamber and blown down into the sample container with low pressure nitrogen. Texas Sampling, Inc., 3706 E. Rio Grande, Victoria, TX 77901. Tel: 361-575-8087; Fax: 361-575-8157.